A group of men involved in a plot to carry out a terrorist attack in the UK using an "army" of children have been convicted today, Friday 2 March, following an investigation by the Met Police Counter Terrorism Command. The Old Bailey heard how detectives arrested ringleader Umar Ahmed Haque, 25 (04.06.92), from east London, on 17 May 2017 after investigating his activities. Haque was in the early stages of planning a multi-faceted attack on businesses and communities in London and had been attempting to radicalise 55 children, whom he envisaged would assist him. Through their enquiries, detectives identified that a further two men were assisting him, both of whom they arrested on the same day as they took Haque into custody. Abuthaher Mamun, 29 (25.09.88), of east London helped Haque plan the attack and tried to raise money to fund the plan. 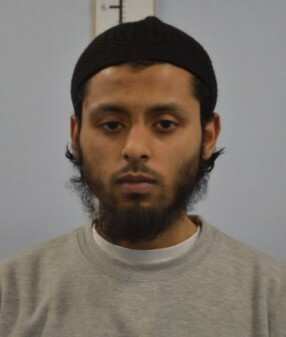 Muhammad Abid, 27 (16.08.90), of east London was a confidante of Haque's as he developed his plan, and made no attempt to report Haque's planned "annihilation" of members of the public to police. The Counter Terrorism Command, assisted by MI5, prevented Haque from pursuing his terrorist plan to target up to 30 groups, businesses and establishments in London. Commander Dean Haydon, head of the Met Police Counter Terrorism Command, said: "Haque was a dangerous man who was inspired by attacks in Europe and Westminster. He wanted to orchestrate numerous attacks at once, using guns, knives, bombs and large cars to kill innocent people. "We recovered a number of exercise books from his home and it was evident from his notes that his plan was a long-term one. He intended to execute his plan years later, by which time he anticipated he would have trained and acquired an army of soldiers, including children." Haque first came to the attention of the Met Counter Terrorism Command in April 2016, when police officers stopped him at Heathrow Airport as he attempted to fly to Istanbul, Turkey. His phone detailed searches for terrorist attacks and executions. While there was no evidence on which Haque could be charged, his passport was revoked by the Home Office under Royal Prerogative. Evidence subsequently gathered by counter terrorism officers demonstrated Haque had begun planning an attack in the UK. In conversations with Mamun and Abid, he discussed various aspects of his plot, from how to increase the strength of a bomb and what type of vehicle to use, to where to carry out an attack and what the police response would be. In a five-hour phone conversation in March 2017, Haque - who was an administrator at an after-school madrasa at Ripple Road Mosque in Barking and Dagenham - told Abid that he had radicalised 16 children. Police had no intelligence to support this claim, but after arresting the group, detectives continued their enquiries and established the full scale of Haque's attempt to radicalise children. Social service workers, together with police, assessed that Haque had attempted to radicalise 55 children aged 11 to 14 while working at Ripple Road Mosque. Commander Haydon continued: "When specially trained officers interviewed the children, they described being shown by Haque horrific videos of extreme terrorist violence including executions. "They told police how Haque made them roleplay terrorists and police officers, with the children acting as terrorists being made to stab the 'police officers' to death. "The children were paralysed by fear of Haque, who they understood to have connections to terrorists and who essentially told them that a violent fate would befall them if they told anyone what he was doing. They were too afraid to confide in anyone. "It's crucial that the police, partners and communities do all they can to identify where young and vulnerable people are being radicalised and I urge anyone with concerns that this is happening to report it confidentially to police." All 55 children have received safeguarding support and 35 have been assessed to require longer-term support, which is being provided to them. Haque's friend Abid, who he knew from a local mosque, listened at length to Haque's plans to kill people including his supposed justification for murder; his hypothesis on the police and public response to a multi-pronged attack and how he intended to have "another 30 or 40 men on standby" if he was arrested. It was in one of these conversations that Haque told Abid of his view that the public should be "annihilated", yet Abid made no attempt to tell police of Haque's atrocious plans. Like Abid, Mamun knew Haque from a local mosque and listened to Haque's plans. He helped Haque strategise, and was planning to take driving lessons so that he could teach others in Haque's aspirational "army" to drive. He also made unsuccessful attempts to invest money online in order to raise money to fund Haque's plans. As part of their investigation, police looked at the activities of Haque's neighbour Nadeem Patel, 26 (25.11.91) from east London. They arrested him on suspicion of possession of a firearm on the same day they arrested Haque, Abid and Mamun, having recovered a Walther P99 handgun from his home. The gun was capable of firing blank cartridges. They also recovered £20,000 cash from around his house. Haque was today found guilty of two counts of preparation of terrorist acts and one count of collection of information useful to terrorism. He had already pleaded guilty to one count of dissemination of terrorist publications and three counts of collection of information useful to terrorism. Today he was found not guilty of one count of conspiracy to possess a firearm. The jury was hung in respect of one count of dissemination of terrorist publications and the judge ordered that this charge lie on file. Mamun was found guilty of one count of preparation of terrorist acts. Abid was found guilty of one count of having information about acts of terrorism. Patel was found guilty of one count of conspiracy to possess a firearm. He previously pleaded guilty to possession of a prohibited weapon, for which he was sentenced to 16 months' imprisonment today. Abid, Mamun and Haque are scheduled to be sentenced at the Old Bailey later this month, on a date to be confirmed.